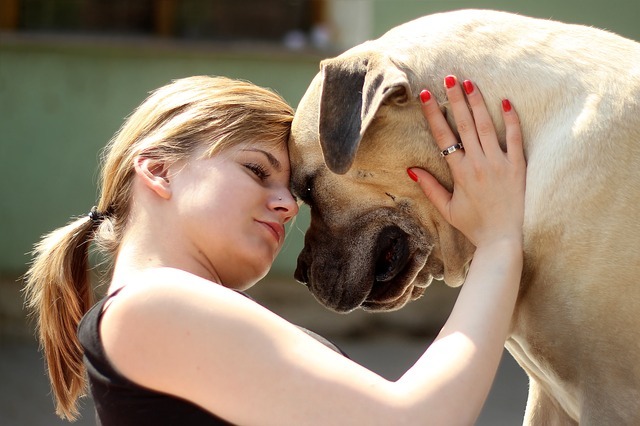 Human or canine, eye contact is a big part of communication. Eyes convey emotion, indicate intent, and they reflect individual personality in ways many people don’t realize. There’s a lot that’s the same when it comes to human and canine eyes—you and your pup can even share the same eye color—but the way dogs understand eye contact will always be slightly different than what seems normal for humans. Understanding how your dog feels about eye contact is important for your relationship, and it’ll help you better communicate with every dog you meet. For people, eye contact (as long as it’s not obviously threatening) can be reassuring and even comforting. People like it when the person they’re interacting with pays attention to them and makes an effort to look in their eyes. It suggests honesty and an interest in the conversation. A study done in 1980 found that students learn better and retain more information when their teachers make eye contact during their lectures. Babies seek out attention from people who look directly at them, and a budding romance usually starts with one person making eye contact with another. There will always be exceptions, like introverted people who prefer not to be noticed, but in general, eye contact between humans is a good thing. In the dog world, however, eye contact is treated differently. Dogs rarely make eye contact with each other. 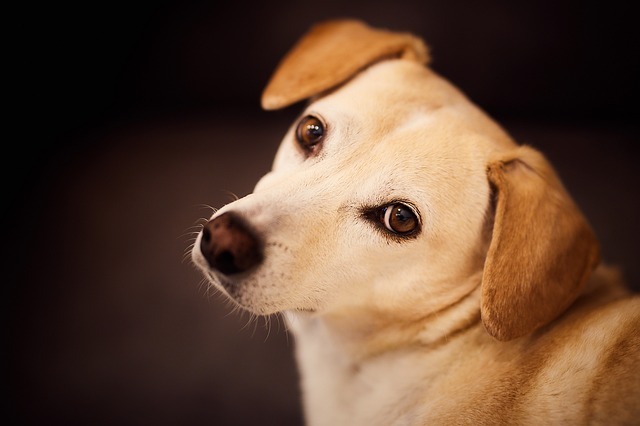 In most cases, dogs lock eyes for less than two seconds at a time, and they’re careful about when they let it happen. If you’re at the dog park, it’s common for two dogs to briefly make eye contact as a cue to start playing. They’ll lock eyes, jump into a play bow, and then set off chasing and playing. In most cases, dogs choose to avoid eye contact altogether. When two dogs approach each other, it’s normal for them to avert their eyes. A direct stare makes them feel uncomfortable, and an uncomfortable dog is an unpredictable dog. They might choose to flee the scene, show submissiveness, or react aggressively to protect themselves from a perceived threat. Behaviorists and researchers have long-since dismissed the belief that dogs view humans as other funny-looking canines, but most dogs treat interactions with unfamiliar people the same as if they were meeting a fellow dog for the first time. From a dog’s point of view, a stranger who makes eye contact is a potential threat. 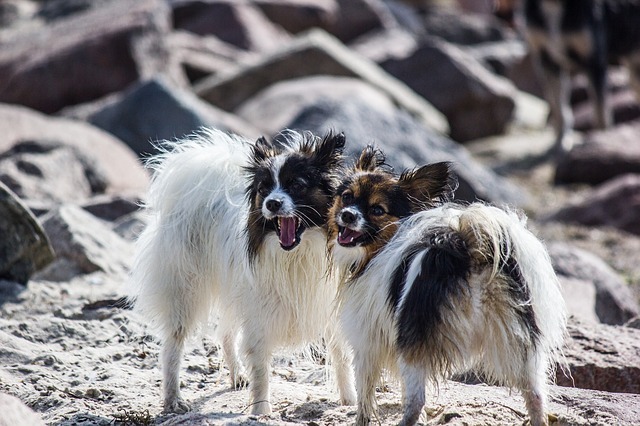 If the dog has a dominant personality, they could react aggressively. Even if the dog isn’t especially dominant, they can still feel threatened and choose to fight instead of flee. Whenever you come across an unfamiliar dog, whether it’s a stray or a dog you’re thinking about adopting, keep your gaze away from their face. Look at their ears or their chest and approach them at a diagonal. You want to show them you’re a friend and not a threat, and to do that, you need to speak their body language. As domesticated animals, dogs have adapted to life with humans. They’ve learned what we like and what we don’t like, and even though they’re not naturally comfortable with eye contact, some are willing to make exceptions for the people they love. They’ve figured out that locking eyes with a particular person might trigger something pleasant, like a treat, praise, or a satisfying scratch behind the ears. Some dog owners train for this behavior, but dogs are also capable of picking it up all on their own. A study done in 2015 suggests dogs understand the power of human eye contact better than we previously gave them credit for. Led by animal behaviorist Takefumi Kikusui from Azaba University in Japan, researchers conducted an experiment that suggests over generations, dogs have learned to use eye contact to form social bonds with humans. As a result, the study shows a person staring into their dog’s eyes produces the same biological response as a mother looking at her child. Both bonds trigger a release of oxtyocin (a hormone that makes you feel good) in both people and dogs. Some researchers believe it’s possible dogs started staring into human eyes on purpose to cement their position as man’s best friend. Should You Stare Into Your Dog’s Eyes? The answer to this question depends on your dog. If your dog is confident and comfortable by your side, looking into their eyes could set off a flood of feel-good hormones that leaves you both blissfully content. It could help make your already strong bond even better. If your dog is the timid type, is still getting used to you, or has a history of not trusting humans, however, forcing eye contact could make them feel uncomfortable at best and intimidated at worst. You can teach your dog that eye contact with you is a good thing by playing a game called “look at me.” Have your dog on a leash and every time they voluntarily look you in the eye—even for a split second—reward them with a treat and praise. For dogs that are unlikely to look in someone’s eyes, try holding the treat directly in front of your face to guide their eyes toward yours. The game should be a positive experience, and over time, it can show your dog that only good things happen when you look into their eyes.